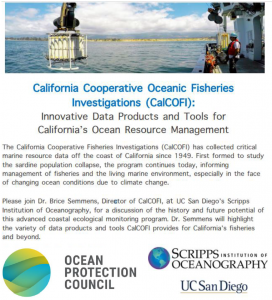 California Cooperative Oceanic Fisheries Investigations (CalCOFI) Director, Brice Semmens, presented on CalCOFI’s innovative data products and tools for ocean resources management at a public presentation in the California State Library on Tuesday, September 18th, 2018. A video recording is now available. Ocean Protection Council partnered with Scripps Institution of Oceanography and UC San Diego to host this presentation. For more information, please visit CalCOFI’s homepage.